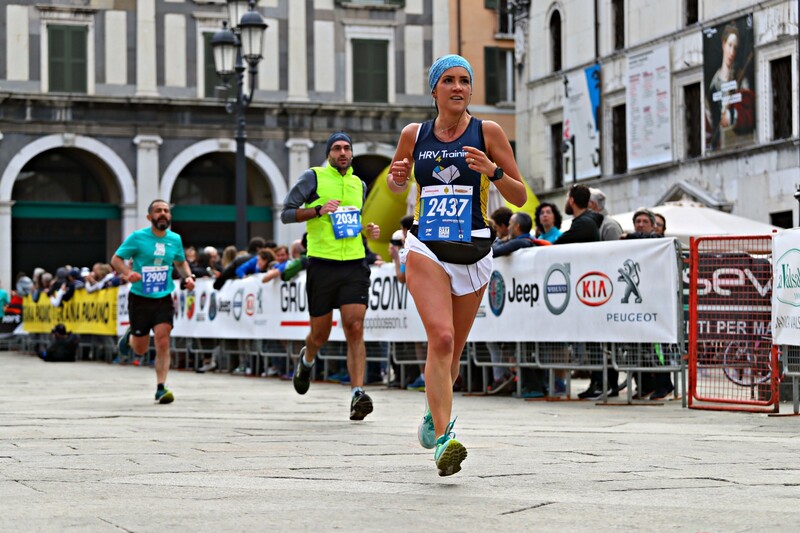 Brescia Art (half) Marathon, March 10th, 2019. Four weeks before the Milan Marathon, main goal of the season. Serena ran her first marathon last Sunday in Milan, closing in 3 hours 56 minutes and 57 seconds. In the past three months, I have worked with her to prepare the race. 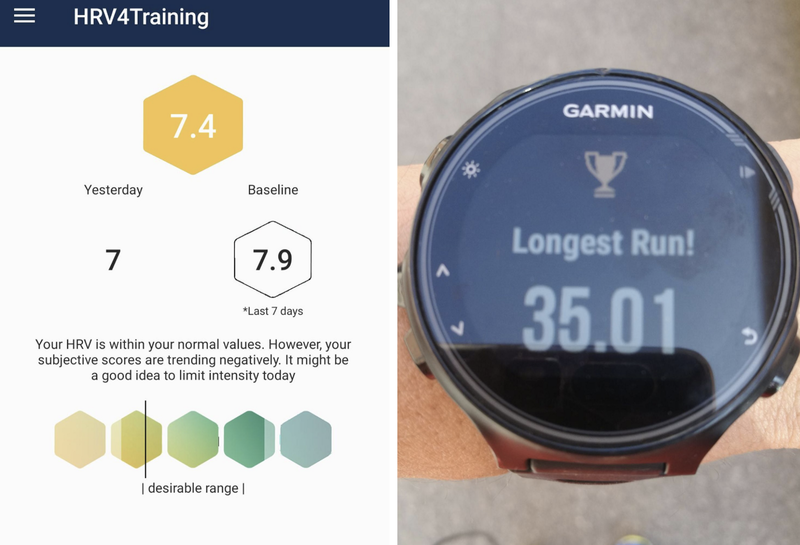 In this post, I’d like to cover a few aspects related to how we used HRV4Training to monitor progress and make a few adjustments. Serena’s result is really impressive considering the demands of her job (senior analog designer holding a PhD in electrical engineering) and life (a 2-year-old daughter at home), the fact that she had never run more than 21 km with 10 weeks to go to the marathon and the possibility to run only 4 times per week, mostly due to other important commitments in her life. This situation is probably familiar to many of you, especially the ones that decide to use HRV4Training to better manage work and life stress, and therefore I think it can be helpful to go over the past three months and look at some data. 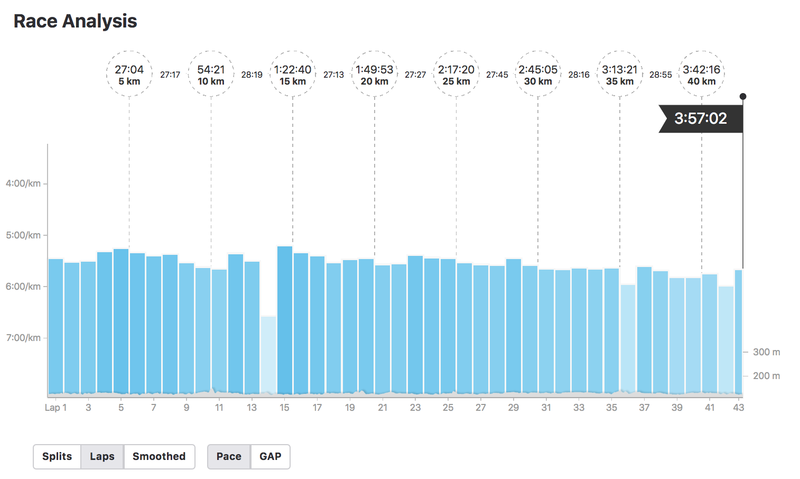 Needless to say, there is only so much you can plan and adjust, and marathons can get ugly real quick. The credit for pulling off a great race goes all to Serena — thank you for trusting me in the process! 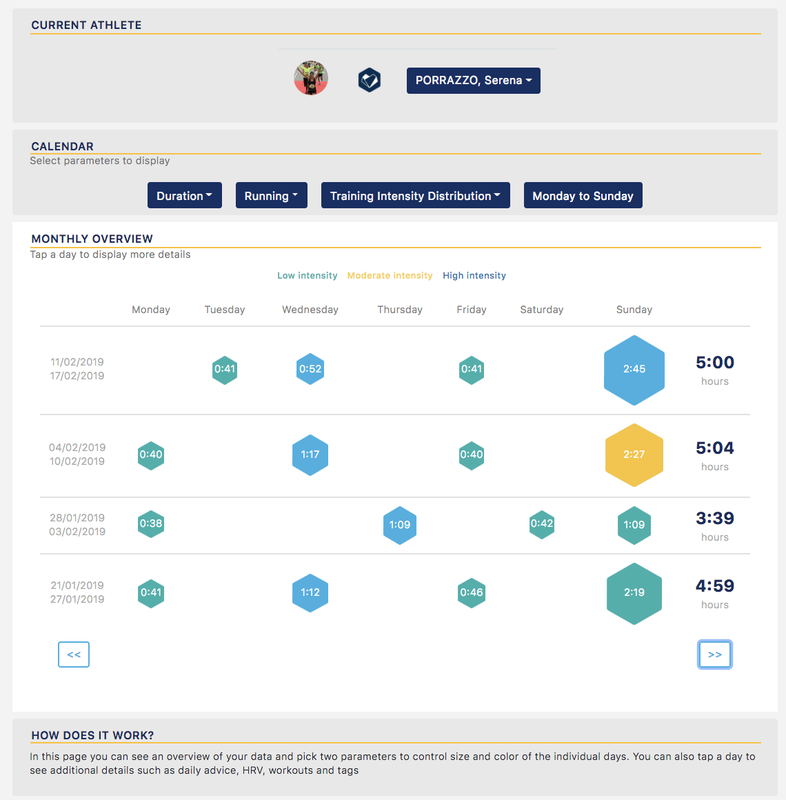 Alright, let’s talk marathon training and data. Serena is a friend and also HRV4Training ambassador, and I had been following her training for a while. When she reached out with the goal of running a sub-4 hours marathon, I knew it was possible given her track record, but we really had to make the most of these 12 weeks. On the left, a typical week before starting the 12 weeks plan, including mostly low intensity and moderate intensity work. On the right, one of our first weeks approaching the marathon, with weekly high-intensity workouts and longer runs that varied over the course of the plan (started easy and fully aerobic, then we included some additional work such as a few minutes at higher intensity). Training intensity is color-coded based on aerobic and lactate thresholds configured in HRV4Training Pro. Great ability to sustain long efforts just below lactate threshold. 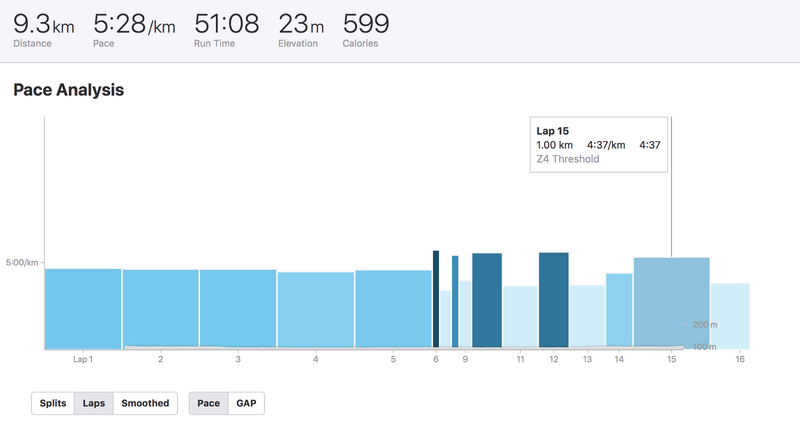 To get some data to back my initial guess which was based on just looking at her Strava activities, I asked her to perform a simple workout assessment including a few relatively short intervals (2 x 400m + 1000m). Serena’s 1 km hard effort was really close in terms of pace to what she could sustain for an entire half marathon, which tells me that in an ideal world there is work to do in terms of top-end speed. However, given our 12 weeks, we’d try to make the most of her current abilities and extend them to the demands of the race — a full marathon. When you already have a good idea of the athlete you are working with, a short test such as the one carried out here can be helpful. I don’t believe much in long(er) assessments, to me the psychological component is extremely different during these tests with respect to racing, and the difference can be really big in terms of performance for anything that lasts more than a few minutes (let alone that as the recreation athletes we have to squeeze these sessions between a work meeting and lunch). On the other hand, I’m sure we can all pull off very hard efforts for periods of less than 5 minutes, which is why the test included some warm-up (20 minutes easy + a few strides) and then 2 x 400m with 2 minutes in between, and 1 km hard almost all out. The outcome was as expected, with the 1 km hard closed in almost 4’40”, which is relatively slow for someone that can run a 1h45’ half marathon (5’00”/km). Please note that these are just my considerations and speculations on what I thought could work in this specific case as I had background knowledge on the athlete in question, and the same might not be applicable to others. As Serena was always training even before I started working with her, she was well conditioned, which meant we could still try to do a short generic phase with added speedwork instead of the more typical aerobic phase in which only slow running is performed. This is what we call non-linear periodization. Overview of the macrocycles and detailed view for one week during the Specific phase. 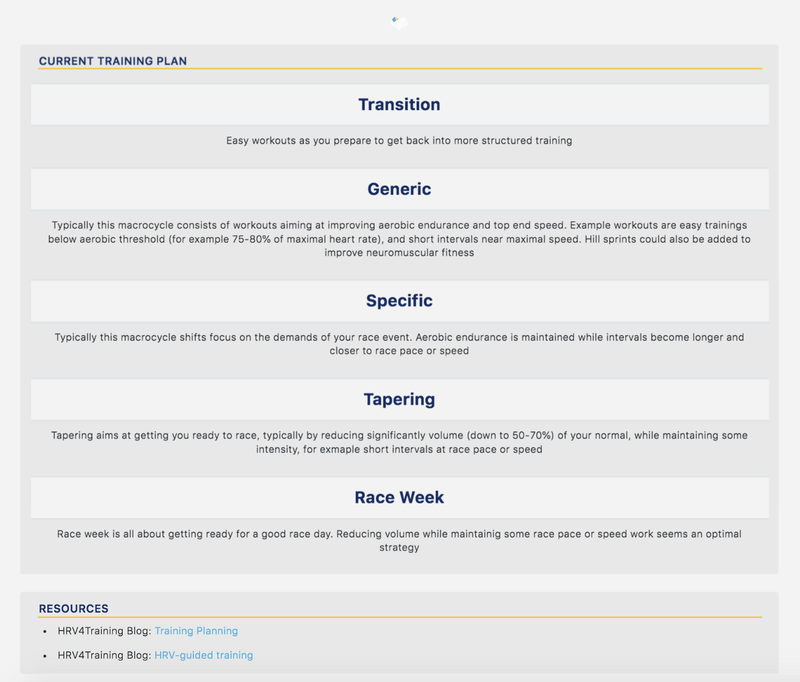 Learn more on training planning in HRV4Training Pro, at this link. Given the short time and limited volume, the risks were high. This is one more reason to use HRV4Training to closely monitor physiological responses to these stressors and try to keep Serena healthy and injury free (which ain’t easy — as I keep proving). While I am personally particularly fond of a polarized approach to training, which means performing some really hard sessions per week and keeping the remaining (and majority) of your workouts really easy (learn more here) — in this case I think this is even more important given what just mentioned in terms of the additional stressors added. Training intensity analysis in HRV4Training Pro. After configuring your aerobic and lactate thresholds, you can analyze the distribution of workouts performed at different intensities over time, and clearly see changes in workout intensities when changing training method (to a polarized one for example) or just macrocycle (read below for more details). Here is where things get really boring for someone starting with this approach, as your average easy runs start to take quite some time and feel terribly slow. Yet, Serena trusted the process and stuck to the plan. We can see in the plot above how we killed moderate intensity runs (yellow part) when we started working together in January and introduced high-intensity workouts (blue part). 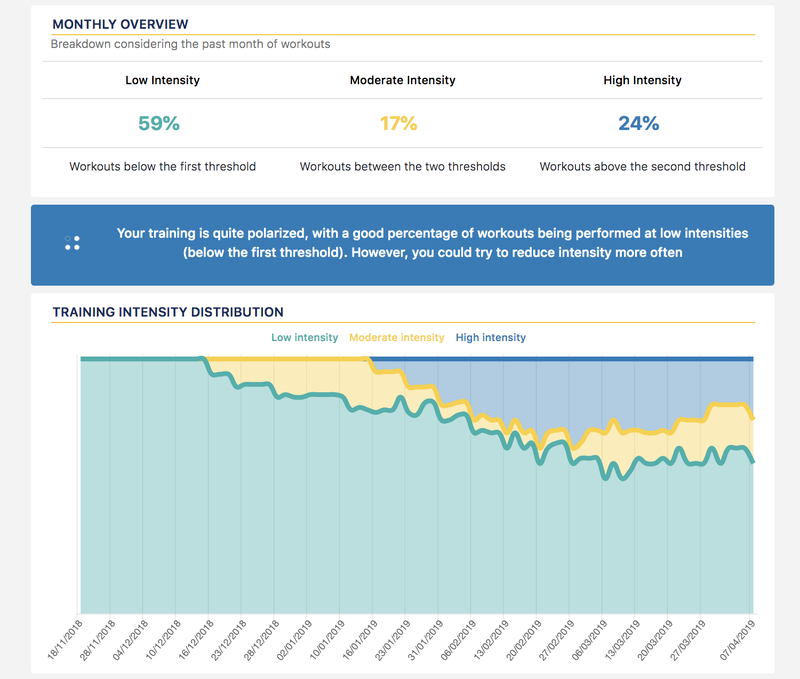 As we shift from the generic to the specific phase of the plan, we re-introduce some more moderate intensity workouts, for example race pace work — you can see the yellow part getting wider again towards the last weeks. Chronic load, shown in blue, slowly increases as we build up to the race. Acute load is shown in orange, with peaks indicating mostly long runs. Freshness and injury risk are derived from acute and chronic load. 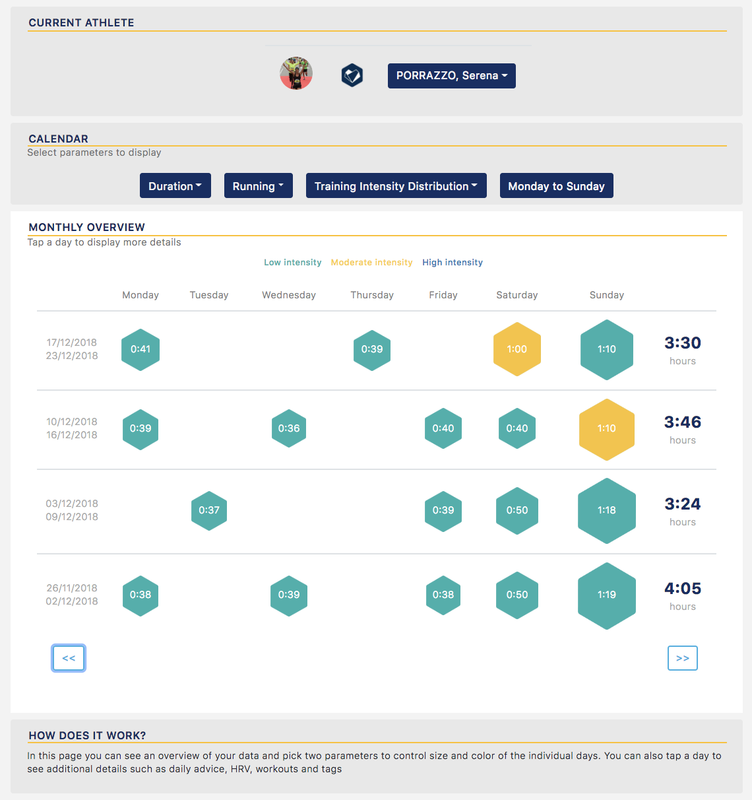 HRV4Training Pro abstracts day to day variability in these metrics to provide you with an overview of how things are going any given week, as shown at the top. Big picture first. However, while I believe these plots and analysis are informative, they do not consider how our body is responding to the stress stimulus. If the input is a long run, the output is going to be the same plot no matter how your body responds to that run — which can differ greatly as we will soon see. Here is when heart rate variability (or HRV) data comes to the rescue. As HRV reflects physiological stress, we can determine an individual’s response to training and make adjustments when necessary (if you are new to HRV, check out this deck). The top plot shows HRV data, typically a higher score is associated with a more rested physiological condition (less stress). On the other hand, lower values are associated with higher stress. 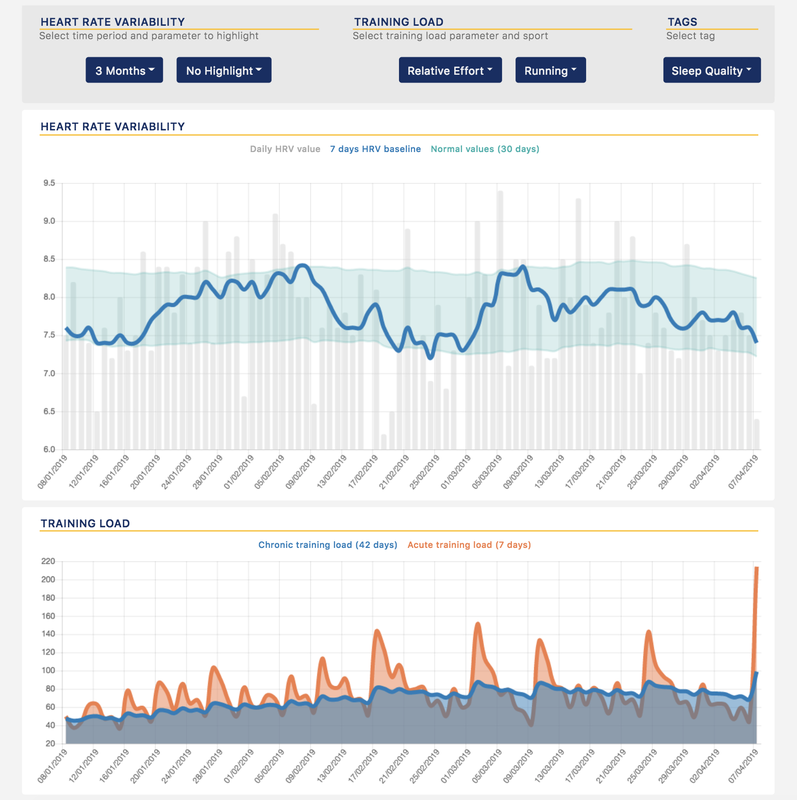 HRV4Training Pro contextualizes your baseline (blue line, computed using the past week of data) with respect to your normal values (the larger band) so that you can easily spot periods of significantly higher stress (baseline below normal values). The second plot shows training load, as discussed in the previous section. 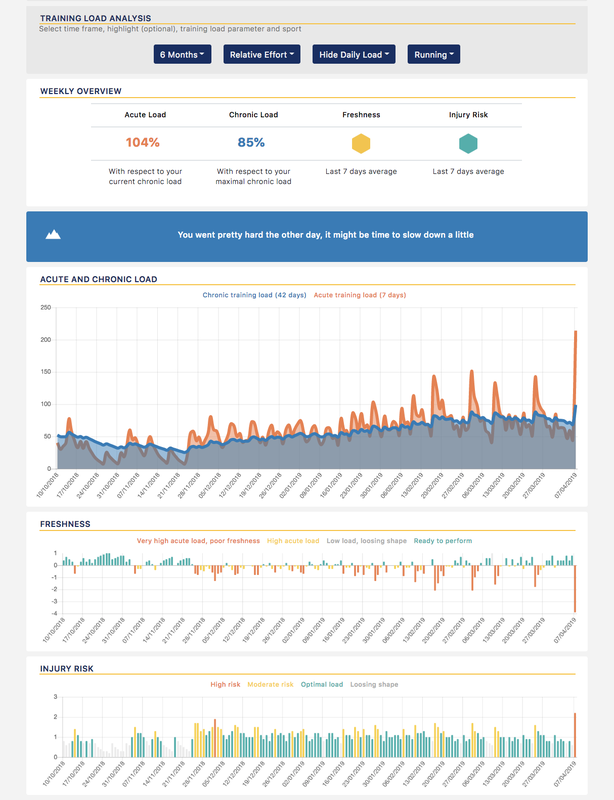 Learn more about this visualization, at this link. Above we can see how things go really well for the first month (increasing or stable HRV baseline highlighting positive adaptation) until we really step it up with training. 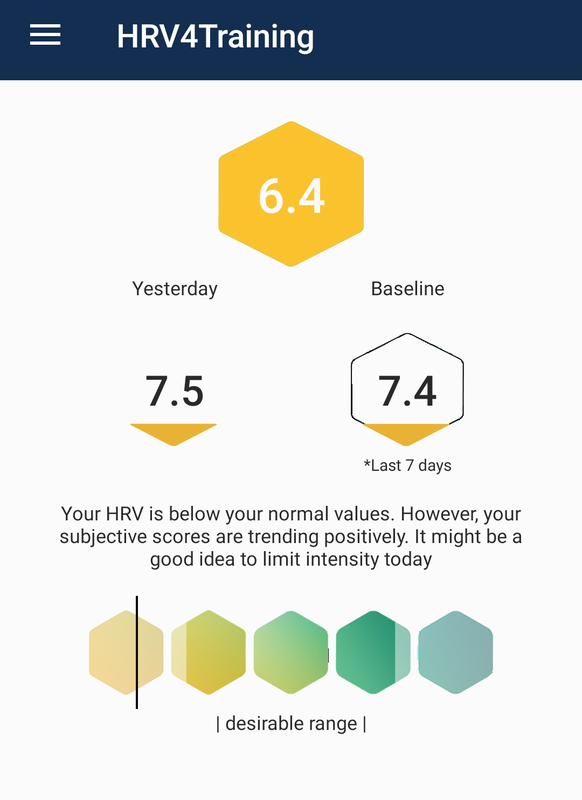 Around February 17th, HRV starts to sink. We had just gone through 2 big weeks, with 26 km and 30 km runs over two weekends, all uncharted territory for Serena. By the time we reach February 22nd, the baseline is below normal values, a clear red flag. You can see here how proper periodization (an easy week was planned right after this block) and feedback from HRV4Training was used to take a longer break before getting back into that kind of very demanding training (the next acute peak is at the beginning of March). 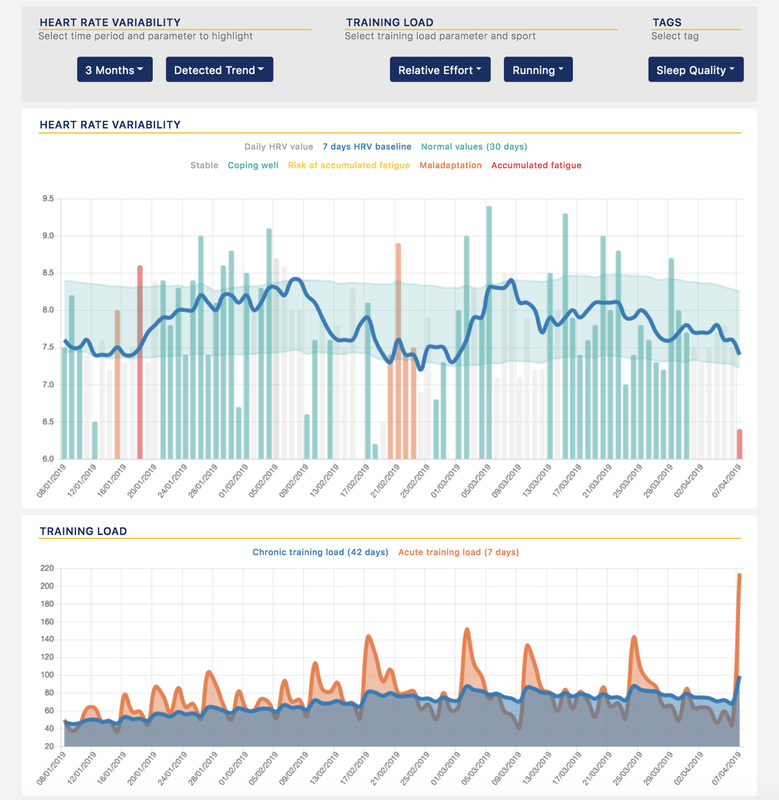 Automatically detected trend in HRV4Training Pro, learn more here. We can see how HRV4Training determined that there was an issue in adapting to this high-intensity and higher volume work (flagged as maladaptation, shown in orange above) around February the 21st, and for several days afterward. Here you can see a clear case of how “not killing yourself with training” when your body is really stressed, is a good idea. After a period of reduced acute load (no orange spikes), HRV bounced back and stayed within normal values until the marathon, despite some really hard sessions in the following weeks (a half marathon race and a 35 km long run). During these weeks and for a long period, the automatically detected trend reported that Serena was “coping well with training” (shown in green above) which gave us confidence it was all going in the right direction in terms of physiological adaptations. This is in accordance with what has been shown multiple times in recent research on HRV-guided training, which typically consists in holding back when your body is not in good condition to assimilate the additional stressors (in practical terms this is done by checking your baseline against your normal values, exactly as shown above) and in performing high-intensity training when the athlete is in optimal conditions (HRV baseline within normal values — I’ll say it once more: HRV baseline within normal values means it’s all good, because when working with these data, normal is good). This approach resulted in improved performance in both runners and cyclists, with respect to standard training periodization (which even included more high-intensity workouts — but without considering an individual response to training — timing matters!). With only a month to go, things were going better. The trouble handling the high-intensity work and long runs (while managing everything else that is not training) was now behind us. At this point, HRV was trending positively again, so we decided to stick to the (demanding) plan. These weeks included more race-specific work which meant longer intervals (2–3 km reps at 10k to half marathon pace) and still the usual long runs, with rest days and easy runs below aerobic threshold in between. For the half marathon, we wanted a hard effort but also to save some energy for the last long runs before the marathon. Serena raced in 1h47' (5'06"/km), a result very close to her PR, but without going all out. Toughest week of the last training cycle. Yet, this time the hard and long effort was well assimilated, most likely because at this point we had done already 6–7 long efforts (see the last 2 weeks of the HRV plot above). With the HRV baseline well within normal values, and tapering next on the table, we proceeded as planned. The last (huge) detail to sort out was race pace. This is not an easy task for someone approaching the first marathon, especially considering the poor job done by most tools out there, which seem to be all really optimistic one what we can do. For the race as well as for previous hard sessions, we relied on HRV4Training’s pace zones and estimates. This is work we have published and is documented here. 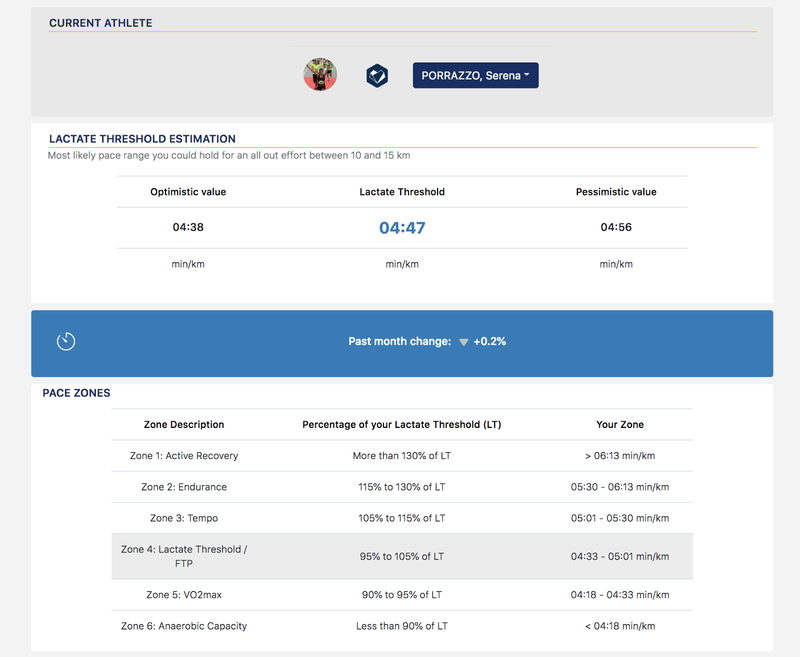 HRV4Training uses your workouts and physiological data to estimate your lactate threshold and determine your pace zones, which we would use only for hard sessions (I prefer to use heart rate for low-intensity work, as it reflects the actual work the body is doing, and rely on pace or RPE for high-intensity work or racing). Serena’s pace zones as determined by HRV4Training’s lactate threshold estimation algorithms. Intuitively, knowing your lactate threshold can help you defining pacing strategies for racing events between the 5 km and the half marathon. For longer distances, other factors such as training volume start to play a more important role which is why we have built models that integrate such information (e.g. the number and frequency of long runs). 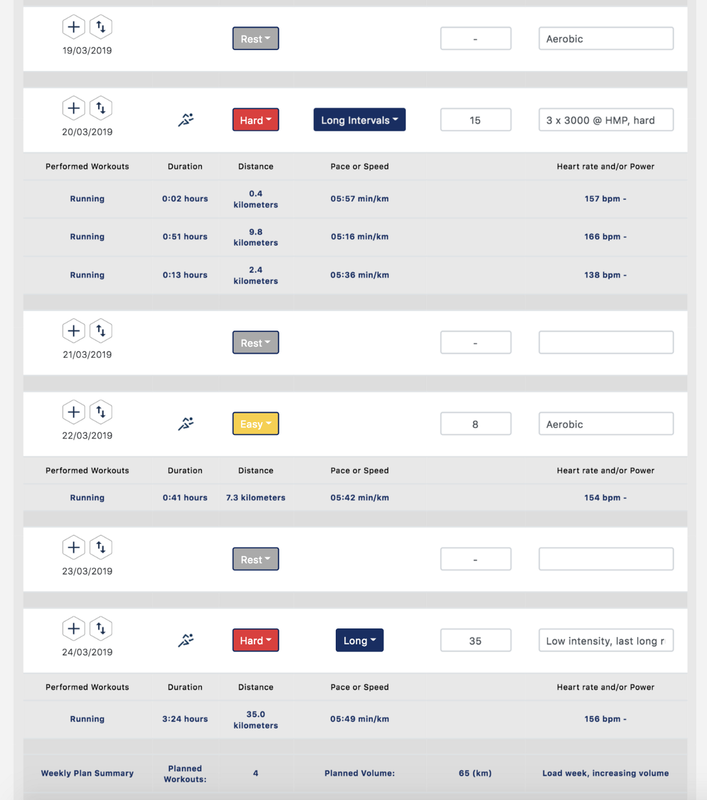 Hence, the marathon time estimate gets more accurate as you also do more marathon-specific work, in terms of intensity and duration of your runs and it’s a good idea to keep an eye on how the estimate is changing as you get closer to your race. Here is what we had the day before the race in Serena’s case, which confirmed the goal was feasible. We settled on 5'35"/km as marathon pace, which would give us some margin for the sub-4 goal. 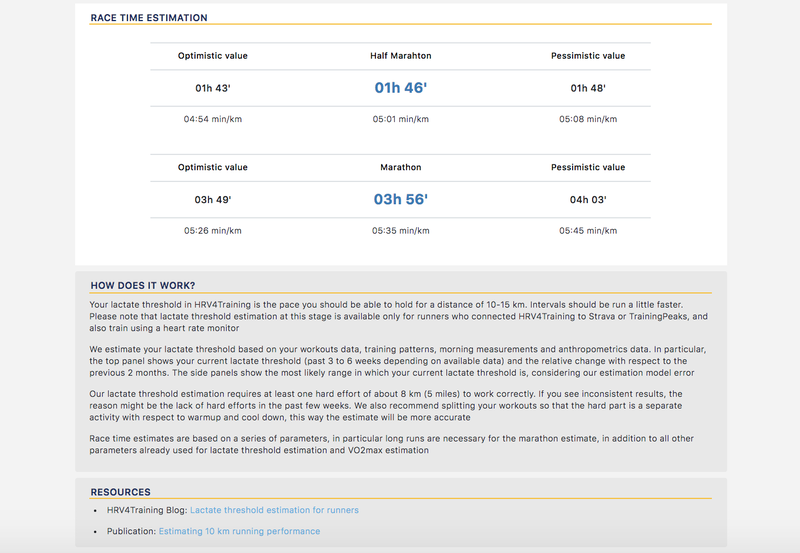 Marathon time estimate in HRV4Training Pro the day before the race. Serena finished in 3h56' and 57". Close enough? Race day started with a low HRV score. This gives us the opportunity to discuss some very important points and misconceptions. In case you’d rather not know your score on race day to avoid being influenced by it, simply disable the daily advice from Menu / Settings / Hide Daily Advice in the app. First of all, this is marathon day. There’s poor sleep, anxiety, excitement, a really early alarm clock, you name it. It is perfectly normal for your heart rate to be elevated and your HRV to be low under these circumstances, and there is nothing to worry about. This is good stress, and context (it’s race day!) should keep your mind at ease. Serena didn’t sweat it. She knew this was a weird day and her data was trending well in the past month. The second point I want to make, which also speaks to what I’ve just mentioned, is that if you are healthy (literally not sick), a low score does not mean that you cannot perform. A low score means that your body is already a bit stressed and that consistently putting extra stress when you are in these conditions, will most likely lead to a poor response, for example maladaptation or overtraining or the need to take longer breaks later on. This is why when Serena’s HRV was below normal values, no hard workouts or long runs were scheduled. Do you see the difference? A low score means that it is a bad time to provide a hard stimulus in the context of improving future performance. This is why when we train, and the goal is training (improve as much as possible for our race), it is a good idea to hold back. If it is race day, it does not matter. We’ll anyways rest for some time after the race, before getting back into high intensity training and we’ll recover from this effort — we can still perform on a low score. This goes together with the fact that if you raced and your HRV the day after is good (which means ‘within normal values’, not ‘high’), it does not mean you should go out and go hard again. It simply means that you are still coping well with all the stress, racing included, and you can proceed according to plans (and your plans should include an easy day!). Never forget that step 1 is to have a plan. Step 2 is to adjust it based on your own physiological response to such plan, which is what we have been doing in the past 3 months leading to the race. This result was achieved with a relatively low volume (about 55 km/week), alternating 2 weeks of higher volume (including increasingly longer runs) and 1 week of recovery, for 3 months. The second half of the 3 months was harder, including a race and longer runs, as well as busy days at home and some annoyance at one knee. Thus, we often shifted to a 1-week load 1-week recovery strategy, to allow for proper recovery and assimilation of the training stimulus. It cannot be underestimated how important it is to be able to make changes and adjust plans on the go when preparing a marathon, especially for “the rest of us”, often living with high stress and less time for recovery. In this post, I’ve covered the 12 weeks leading to Serena’s first marathon. We’ve seen how HRV data could be used to analyze positive adaptations (increasing or stable HRV baseline) and to determine when to hold back if necessary (HRV baseline below normal values, or maladaptation detected). We’ve also seen how to analyze training intensity distribution and how to determine race pacing strategy using HRV4Training Pro. Finally, we had the opportunity to discuss HRV scores on race day and what they mean. As always, while this post is about data, there is no use in data without common sense. Data is not here to replace our brain. Data is here to help us improve our understanding of our body and perception of stress and effort — something we are really bad at, especially as recreational athletes. It took me years to understand that I had to slow down. 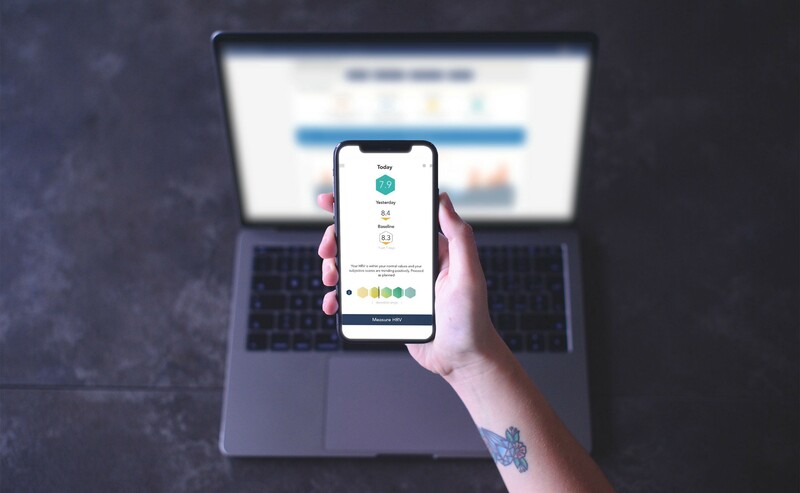 Hopefully, the tools we have developed will help you to learn more about how you respond to stress and to manage things better. Thank you again Serena for working with me in these three months and congratulations again on your sub-4 marathon!